Anyway, Vin’s been hard at work writing this awesome action-packed zombie story for the past year and self-published it on Amazon. For those of you who haven’t already bought the softcover or e-book version, click here; also, if you already have a Kindle, you can borrow the book for free. In December, I started collecting images for inspiration for Vin’s birthday cake and compiled a bunch here and there in Microsoft Office documents and saved them in my Google drive account for reference. 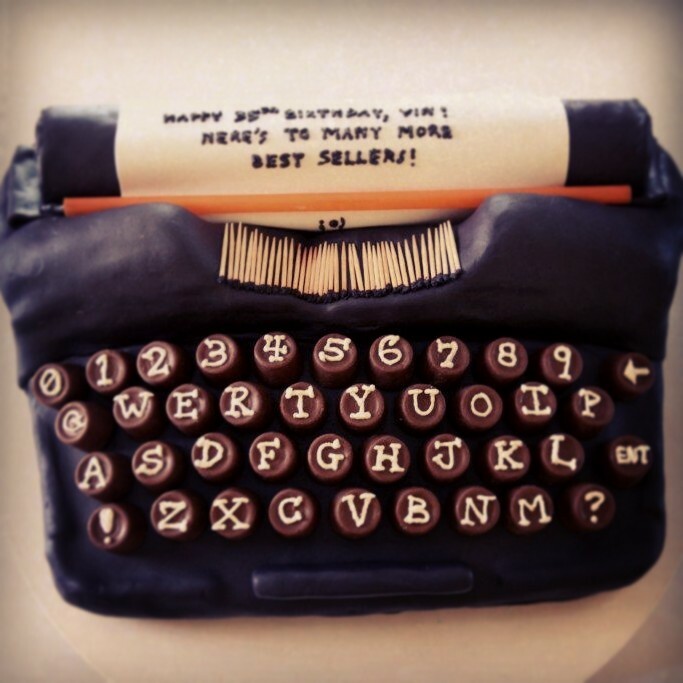 I know what you’re thinking, but no, I didn’t plan on making him a zombie cake; I was browsing the Internets for old school Underwood typewriters. At the time, I told Vin I had a great idea in mind for his cake already and that it would be a surprise. In early March, Vin said he had a request for his birthday cake. (We’ve gone from “No, I don’t want a cake for my birthday!” to specific requests now. Good job, Me, for shooting myself in the foot. 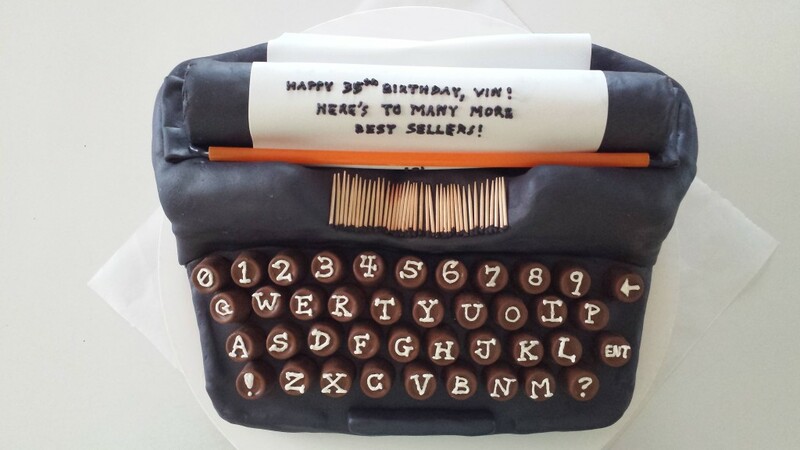 Hahaha) He said he was really thinking about what he wanted and said: a typewriter cake. Not just any typewriter, but an old vintage looking one and told me to check out images on Google. But only if I could do it and had the time to do it. I said, “I was planning on making it for you anyway. I decided in January and saved all these photos of cool typewriters from every angle. I sh*t you not” and referred back to my old files of Underwood typewriters dated January 11, 2013. 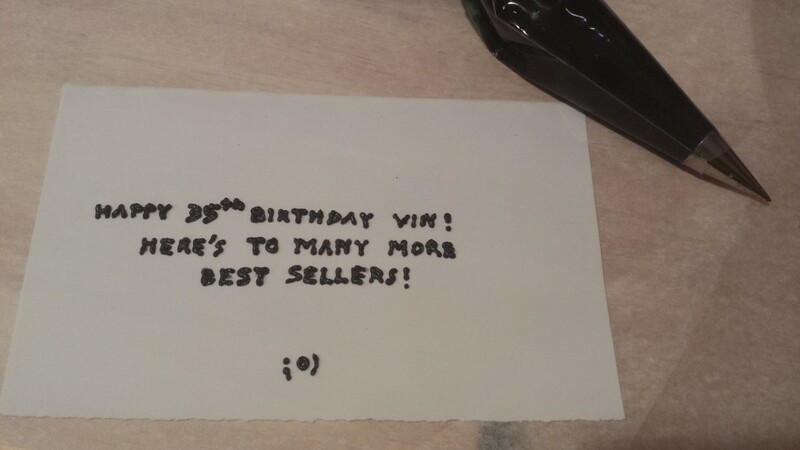 Vin’s response: HAHAHA – awesome!!! This year, the husband’s birthday fell on a Wednesday. There’s no way in hell I’d have time or energy to bake the evening before, so I blocked off the following weekend to bake Vin’s cake so we could share it with family and friends at brunch. (After last year’s leftover cake ridiculousness, I know not to make such elaborate cakes without ppl being present to consume it in a timely manner.) I was also booked to make a small cutting cake and packaged floral garden cupcakes for a wedding so I figured I’d do all my baking for both projects in the morning, set aside Vin’s cakes for later, and work on the grass + flowers goods first. In hindsight, I should have planned out Vin’s cake better. Usually I draw technical sketches and diagrams with breakdowns of height, length and width, what materials I’d need to construct which piece, what special ingredients I need in advance, how to make the cake structurally sound, etc. etc. Nope. The only things that were KINDA thought out were that I could possibly use Rolos as the keys on the board (I was worried they were too big; worst comes to worst we could just give the candy away or use it for something else) and I bought a sheet of white edible sugar paper to use as, duh… paper. Other than that, I just winged it. I baked 3 layers of berry-chocolate cake after making sure the chocolate caramel candy keyboard would fit the Pyrex pan. BOOM! It did. The bottom layer was the thickest and sturdiest with 2 halves of another cake layer cut longways to stack as the higher part of the cake. 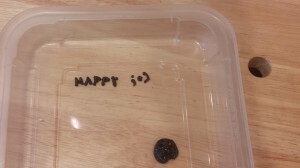 The third cake stuck to the baking dish a bit b/c I stupidly rushed and didn’t put enough liner grease and tried to take it out of the pan without letting it cool @ all, but no matter; I didn’t need it and it’ll be used for future cake balls/pops. I cemented the cake layers in place with the extra green vanilla frosting I made for the “grass” cupcakes, and then carved out the curve where the typebars go and cut out a section at the top where the platen sits. I slathered the rough sculpted cake with more Kermit colored frosting and let the dirty iced cake chill out in the fridge while I rolled out the fondant. 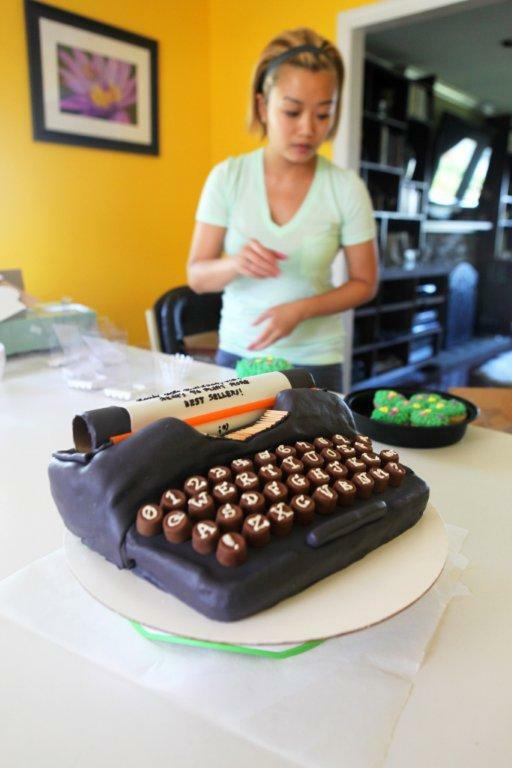 I still had a lot of black fondant leftover from my last project (a clapboard cake yet to be posted), so I rolled out that block and cut out 2 sections: one to go over the keypad area and the other to go over the rest of the typewriter. Placing the fondant on the keypad section was a breeze. And I THOUGHT I did a decent job stacking and stabilizing and leveling the cake… but alas, no. A massive crack started forming at the thin section on the top layer, which started to pull the fondant down and the weight of the sugar coating just pulled the back of the cake apart even more. It was going to be either no cake at all or a creation that was freaking spectacular. I was THIS CLOSE to just scrapping the damn thing entirely b/c I didn’t know if it could be salvaged. I kept trying to push the falling cake back into place, but it would slowly slide down even more. Finally, as a last ditch resort, I wedged in slivers of cake and inserted toothpicks in every which way to try to hold the cake together… The back corner of the cake was totally Frankenstein’d and it was pretty messy inside, but it held. I rolled out another layer of fondant to cover the rips and pulls, and even though it wasn’t perfectly smooth, I just left it at that and moved on to the next part of the cake. 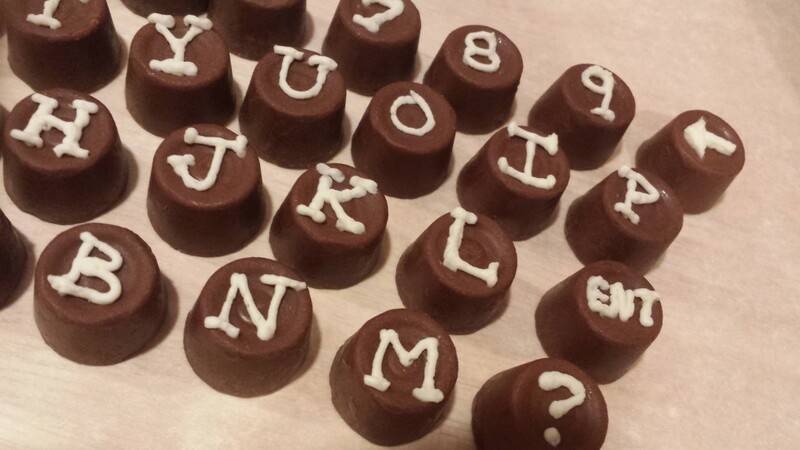 I had piped out letters and numbers on Rolo candies and kept them in the fridge (FYI: I used a serif font). They wouldn’t stay on the cake with frosting, so I stuck the “keys” on toothpicks and inserted them QWERTY-format into the keypad. I had to make black icing to pipe out “happy birthday” on the cake, so instead of leaving bare toothpicks as the typebars, I dabbed black frosting on the tips. Not the most realistic or inventive thing I could have done with it, but it sufficed. I took out this sheet of edible paper and cut it in half; the top section would go over the platen and the bottom would go out of the back to simulate a piece of paper being fed into a typewriter. That stuff was pretty neat since it was flexible like real paper and so the texture and look were perfect. I took the smallest decorating tip I had and practiced hand piping the teeniest, tiniest letters onto a plastic tray. After trying out the word “HAPPY” I decided that was enough practice and braced my arms against the workbench to pipe out a birthday message. I used an empty paper towel roll as the platen (it was the perfect size) and rolled a thin layer of fondant around it. The edible paper was fitted over and under that, and a bright orange straw was a nice kick of color as the bar that keeps the paper in place. It was almost 6 am and I wanted to get a couple hours of sleep, so I just left the cake as is. 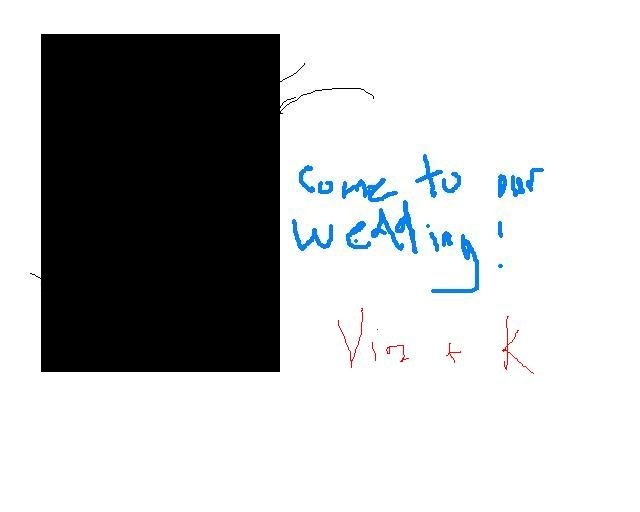 I wasn’t thrilled with it; I mean, it wasn’t so bad to the point where I wouldn’t present it to Vin, but I knew I could have done a much better job. Looking back, I would have formed more spools and knobs and levers and added ribbon to make the cake more realistic and more detailed. If I spent less time fixing the damn thing I probably would have rolled some more pieces out, but foresight and luck weren’t going for me today.